Cadillac isn’t known for making particularly small cars, with their flagship being the Escalade — seating 7 adults, and equipped with a 6.2L V8 — but you’ll be pleasantly surprised with their latest offering, and forgive them for being a little late to the compact SUV party. Starting at $34,795, Cadillac’s new XT4 has a 2.0L turbo 4-cylinder engine and all the luxury features you’d expect to find in a Cadillac. SlashGear took it for a spin last week, and here are our first impressions. At first glance it’s a good looking car. It’s got great street presence and the design details have been carefully considered for both style and function, while the finishes feel sporty and modern. Robin Krieg, Lead Exterior Designer of the XT4, described the design process as trying to design a baby Escalade, with all the best features from the larger model reimagined for this smaller platform. Krieg likened it to a puppy, with large paws and ears but hints of its future full-grown self. “The features are a little bit oversized, the wheels are out to the corners, you’ve got big 20 inch wheels,” Krieg tells us. Cadillac’s intent being to create a very bold statement through this entry into crossover SUVs, with exaggerated proportions applied to specific features of the vehicle, namely the wheels and headlamps, and with really bold graphics in the front. The grill looks considerably more modern than we’ve seen from Cadillac in the past, and there is a distinct lack of polished chrome on the XT4. Instead you’ll see satin silver and gloss-black finishes, color-coded door handles on the Sport and darker diamond-cut wheels. You’ll also notice there is a lot more sculpting of the panels than normally associated with Cadillac, and the lines of the car lunge forward from the rear to give the viewer an impression of speed even while stationary. The Sport edition of the XT4 comes with clear tail lights, letting you see through to the technical elements in the tail lamp. The clear tail lights were originally only destined for the global market and weren’t going to be available in the U.S., but the team successfully fought to have them included here and they definitely give the car an additional dose of style. The interior of the XT4 has been just as carefully considered as the exterior design, with attractive leather colorways and carbon fiber, metallic, or wood accents. The active noise cancellation, 7-speaker audio system, and leather seats with lumbar support — not to mention the optional massage function — make for a very comfortable ride. Even adult passengers sitting in the back will feel content, with the XT4 boasting best-in-class legroom at 39.5” and optional rear heated seats. Beyond all of these thoughtful details, what impressed me the most was the new Cadillac User Experience system. It is one of the most user-friendly infotainment systems I’ve seen in a long time. Near-field technology allows you to sync your phone to the car without any drama by simply holding your phone near the designated area, and the display screen behaves just like a smartphone: touch enabled, swipe functionality to move between screens, and long-press and drag features to reorder the apps you use most. The navigation system was clear, easy to use, and as we were driving through the city it displayed nearby parking options, including the cost to park at each location. The rearview mirror has the option of displaying from a rear camera. However, I found myself feeling a little queasy while using it on the freeway, as if I was viewing the road through my smartphone’s camera. I suspect the change in focal distance takes some getting used to. Although the XT4 doesn’t have Cadillac’s new Super Cruise function it does have lane change alerts with side blind spot warnings, safety alert seats which give you a haptic pulse when you’re getting close to another object, and optional adaptive cruise control. There’s also a teen driver mode which allows you to configure the car settings to encourage better driver behaviors and can provide you with a vehicle report-card on your teen’s driving practices. 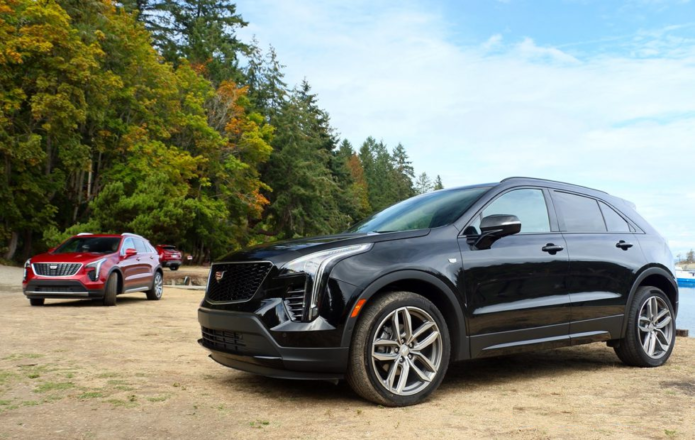 Cadillac’s 2.0L turbo 4-cylinder engine is built in Tennessee and gives you 237 horsepower, enough to make the XT4 feel zippy around town while providing sufficient overtaking power on the freeway. You’ll get 258 lb-ft of torque between 1,500 and 4,000 rpm, and the 4-wheel antilock disc brakes are incredibly responsive. Cadillac has built-in intelligent brake assist and brake fade resistance technology so you’ll get the same braking power at high altitude as you do at sea level and they make short work of even the longest mountain road descents. Cadillac has also added an active thermal management system which allows the engine to warm up faster from cold starts and provide optimized coolant flow between the head and the block to provide the best combustion conditions. The coolant pump is also electric rather than belt driven, allowing for more precise management. With Canada as a prime market, it is unsurprising that Cadillac offers an optional engine block heater for below freezing morning starts. The 9-speed automatic transmission is designed to make nearly-imperceptible changes, which I found to be true unless you really put your foot to the floor, making the changes a little more aggressive. The XT4 has three driving modes, Sport, AWD, and Tour. Tour mode switches you to front-wheel drive for fuel efficiency and less noise when cruising at speed on the freeway or during the summer months when you may not need all-wheel drive. In the Sport mode you can also get active sport suspension with continuous damping control which adjusts 500 times per second, giving you better handling and a more comfortable ride. All in all, if you’re looking for Cadillac luxury, but the grandiose Escalade is a little excessive for your daily drive, the XT4 is well worth your consideration. The design stylings really stand out giving you a unique looking SUV, and the infotainment system feels like a natural extension of all the systems we’ve already learned to use. It’s reasonably priced, all the comfort you’d expect from the brand, while also being incredibly functional. But best of all, it’s fun to drive. They really have managed to create a car which glimmers of Cadillac, but which feels like a fresh, new direction from the company.